The earliest mention of beautiful Pashmina/Cashmere shawls on the western fashion scene seems to be around middle of the 18th century, when these shawls were brought in the suitcases of British officers and merchants on their return from India. Also we find a reference to them in the rich memoirs of Lord Clive. By the end of the 18th century, we find evidence of use of ‘Kashmiri’ shawls by the nobility of Europe, in the portraits of that period. The stiff and formal dressing gave way to softer, flowing style making use of draped ‘Kashmiri’ shawls and stoles. The wave of ‘return to antique/classic’, towards the end of the 18th century further fanned the use of ‘Kashmiri’ shawls. 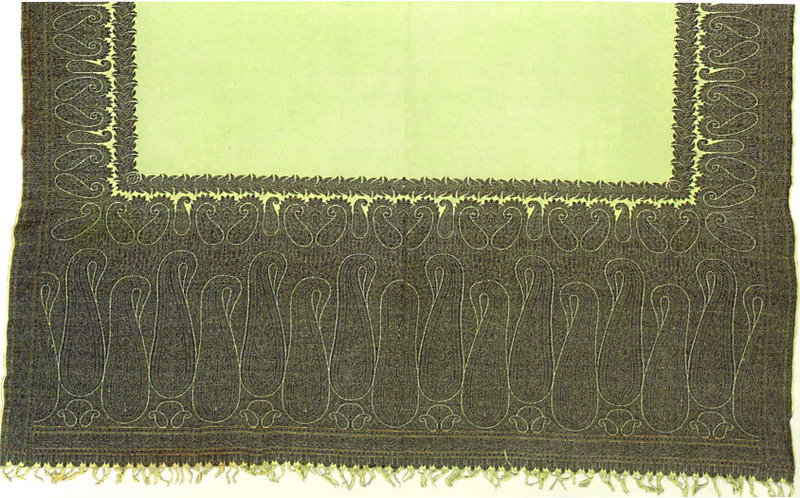 In France, the earliest records of Pashmina shawls talk of these being given as gifts to French rulers, by the ambassadors of Tipu Sultan.,around 1787. It could also be that the beautiful pashminas made their way to France via England or they trailed Napoleon’s military expedition to Egypt in 1798, when a number of soldiers brought back shawls for their women folk. 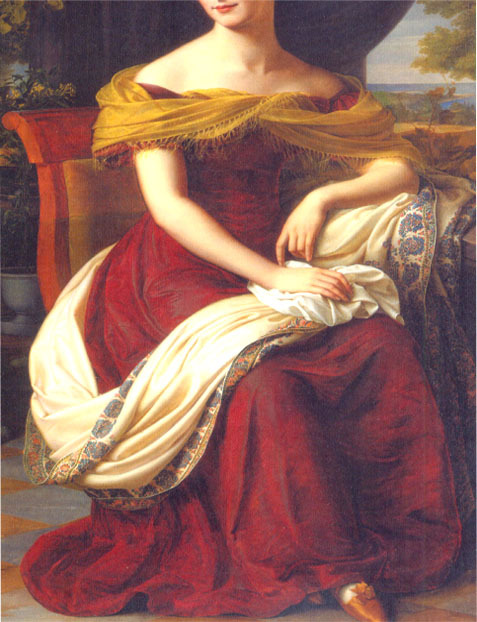 Napoleon’s partner Josephine is said to possess as much as 60 – 400 cashmere shawls! Josephine’s patronage confirmed the fashion, making the delicate cashmere shawl , the rectangular ‘doshala’, fashionable in Europe! Over the years, the popularity of shawl/stole grew because it could be draped in many ways and it was sensuously soft and warm. 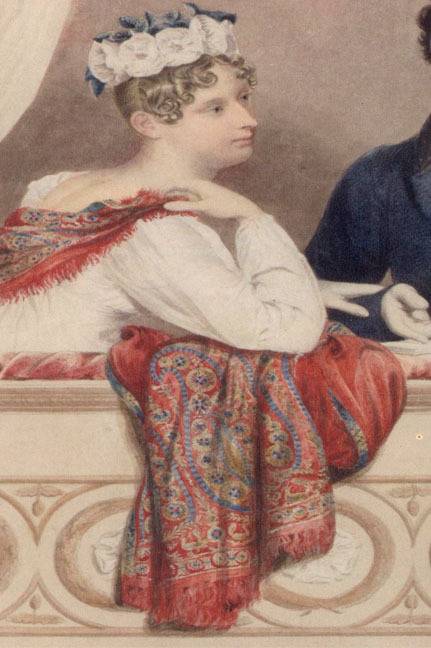 The portraits of the time (l8th – mid 19th centuries) depict the ladies draping a beautiful cashmere shawl; the paisley or other flower motifs adding up to the richness and drama of the portraits! As the 19th century progressed, the industrial revolution swept on and many a down – market imitations were available throughout – in jacquard woven or printed on cotton (lately on soft viscose). The lower cost drapes made it easy for women all over the world to own a shawl and in many cases an imitation! It would be worthwhile to mention here that the shawl historians have discovered a very interesting similarity between Scottish ‘Kirking Shawl’ and ‘Kashmir Doshala’. In both cases, the shawl has a plain white field and deep sober colours palette for the border in classic motifs. In Scotland, a traditional bride would wear it to church (kirk)on first Sunday after her marriage and first attendance at church after her baby’s birth!. The above photo is an example of Kirking shawl, which can easily be mistaken for a traditional cashmere shawl! From the late 19th century to late 20th century, the shawl business witnessed many changes. The traditional big sized rectangular shawls gave way to jackets, waist coats made out of it. More shawls stayed in cupboards (rather being seen in streets or public places), only to be termed ‘collectors’ items’ later. And yet, others were used as ‘throws’ to be draped casually over sofas and pianos! The 21st century has had a mixed response to the classic shawl. At one hand, there is a genuine admiration for the pure Pashmina/Cashmere shawl for its super soft feel, warmth and rich hand embroideries, on the other the modern independent generation seeks the the smaller, less cumbersome styles to go with their life styles!